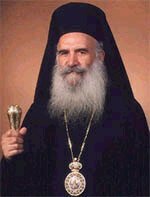 Archbishop Gregorios was born in what is today the Turkish occupied village of Marathovouno in the District of Famagusta in Cyprus in 1928. The youngest of nine children, he was orphaned from his father Theocharis Hadjittofi at the age of just 3. After completing a short time as a monk in the Sacred Monstery of Stavrovouni Cyprus, he was ordained to the deaconate by Archbishop Makarios III of Cyprus. In April 2004, His Eminence wrote to Pam Evans having heard about the Peace Mala. I congratulate you and your colleagues on your commitment to peace and, in particular, to trying to find ways to promote awareness, tolerance and respect between all communities, especially through the Religious Studies' lesson for which you are responsible. All men of goodwill are rightly disgusted by hostility and abuse that is directed against ethnic origin, skin colour and religious convictions. So, anything that can be done to help young people appreciate the evils of such hostility and abuse is to be encourages and supported.